12/8/2015: His ride toward the next great journey came today. Asníkiya él wówaȟwá. May his family find peace. I created this video tribute to the Coyote of our time. I hope you all are as inspired by his words as I am. 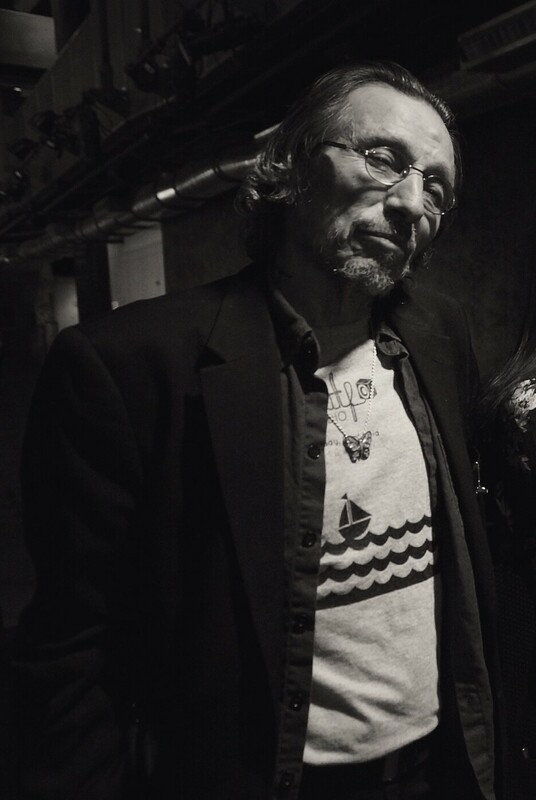 12/4/2015: I write this as I learn John Trudell is, in fact, alive. Despite this trickster dancing away from a digital demise and living another day, it must be noted Lekšila is indeed sick, and so a part of me feels good knowing I joined in with hundreds – thousands – tonight who wóčekiye kága – sent up prayer – smoke and song in honor of one of the greatest warriors of our time. 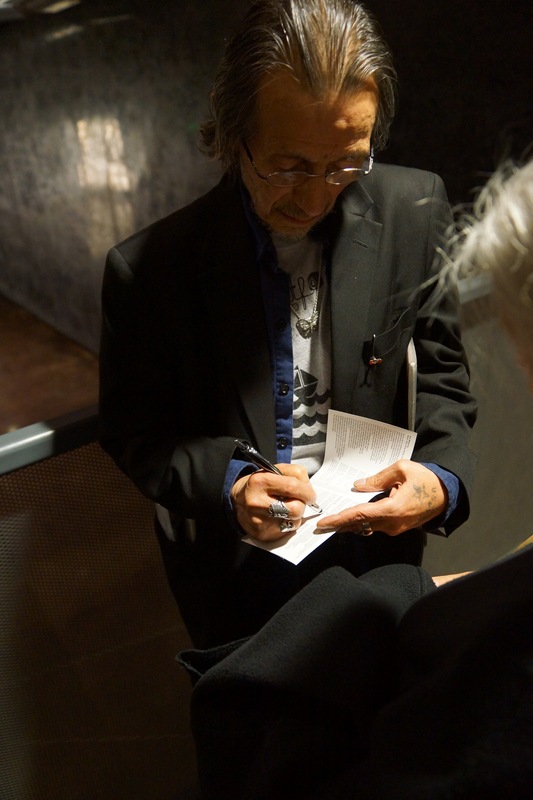 Tonight, I feel blessed to be able to say I interacted with Trudell twice this year – once for a story that ran in Native Peoples magazine and then again a short time later to hear him speak in Colorado Springs. 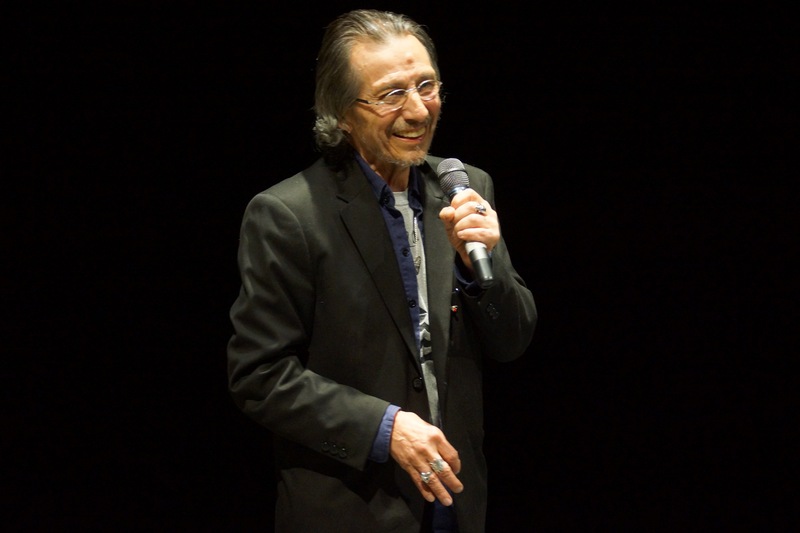 Within those two meetings I touched upon a small but powerful aspect of what I think draws people to Trudell: His obvious passion for life and the worlds around him rang true in his every word and action, without apology. I wrote the following immediately after hearing him speak in Colorado. I thought about publishing it, but it felt incomplete and it’s been gathering dust in my hard drive since April. Maybe it was always meant to be shared now. 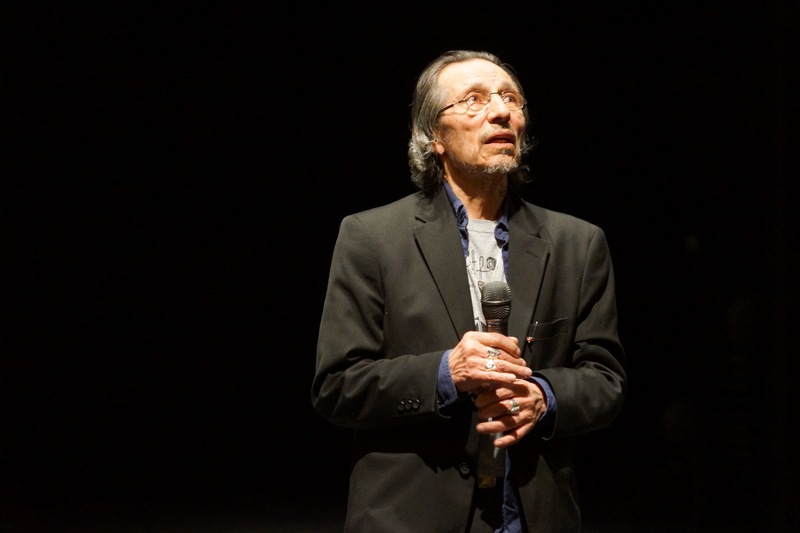 April 10, 2015: John Trudell (Santee Dakota) begins a recent talk in Colorado Springs by informing the audience he‘s crazy. 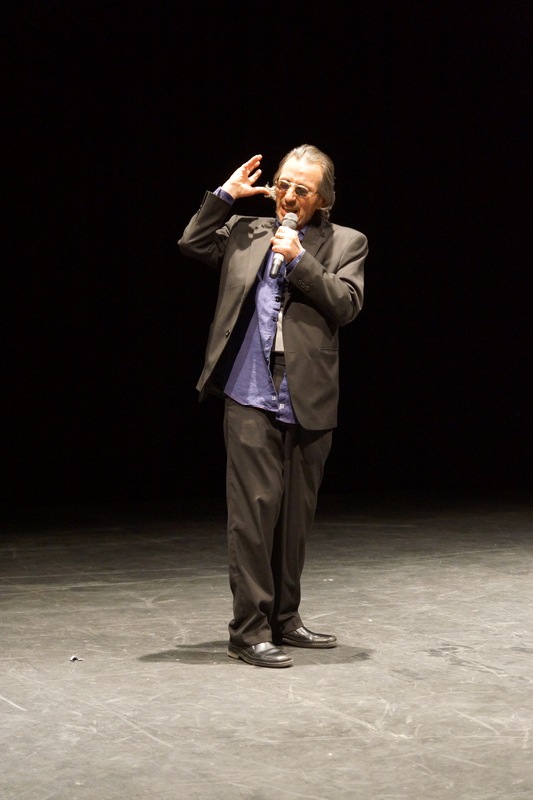 He says it with a swagger and smile, because for him, it’s something to be proud of, another identifier in the 69-year-old’s long list of credentials: Poet, author, musician, activist, actor – and crazy. Not the mental illness kind of crazy. The witkó kind of crazy. He’s not making an ableist dig. 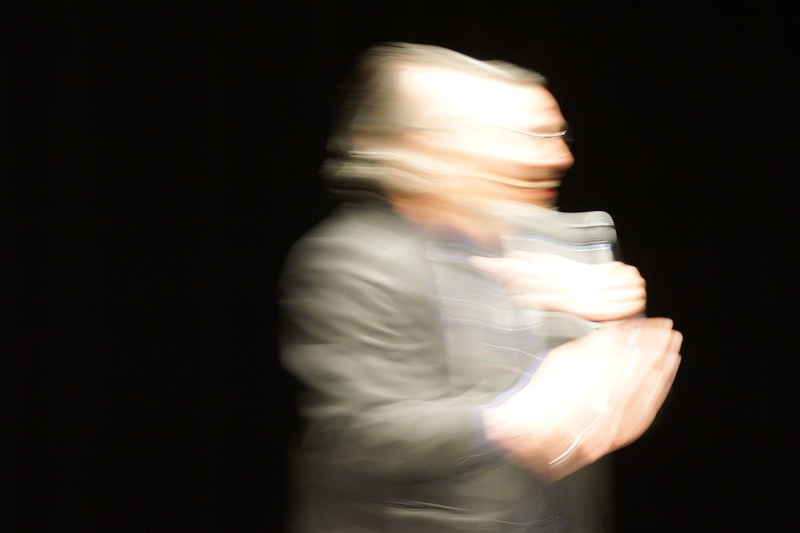 Trudell defines crazy as “not feeling powerless.” Being crazy, he says, doesn’t make him feel powerful, necessarily, but his kind of crazy – the ability to think for himself beyond the “normal” narrative shoved down our throats by the They and Them 2 Percent – has protected him throughout his life. I can relate to this – and, really, haven’t we all felt crazy – as in too different to belong – at some point in our lives? And we’ve associated this crazy disconnect with negative feelings: “If only I were lighter skinned/thinner/blonder – NORMAL – I’d be more accepted.” To reclaim crazy as a positive identifier is a kind of power. 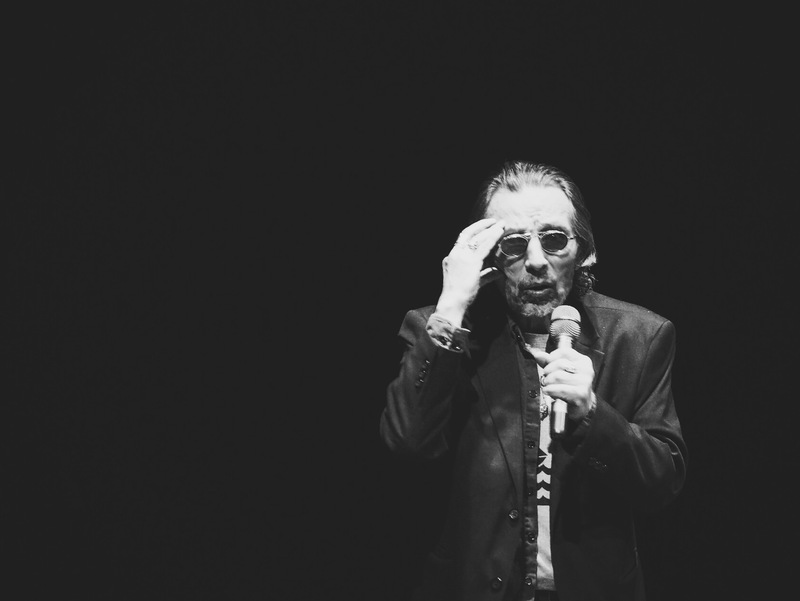 In my older years, as my brain has developed into more of Me (what Trudell refers to as moremes), I’ve accepted my crazy. My not-normal. Myself. I look in the mirror and I’m like, “Damn. I’m totally attracted to what I see in the mirror, stretch marks and flab and muscles and all of it.” I embrace the fat. Embrace the undyed dark and graying hair. Embrace my face without (a ton of) makeup (I LOVE EYEBROW FILLER AND ACNE COVERUP, OKAY?! #sorrynotsorry). My body is strong. I’m alcohol and drug-free (caffeine is GOD, though). I’m smart as hell and dangerous with a pen and paper. My good friends are amazing and think I am, too. I’m a great mother. Let’s pause here for a second. No one, not even Trudell, is saying he’s perfect. Dude was part of a movement that both helped and hurt a lot of people back in its heyday. He’s known his fair share of joy, happiness, pain, and loss. Maybe he could have been a better son, husband or father. Probably all that – I don’t know. But I think he’s more than balanced the scales over the course of his life. For myself, I’m still learning how to live with the sins of my past and mistakes of the present, but I hope to one day judge those against my impacts on this world and those around me, and that others can see the humanity in all of it. 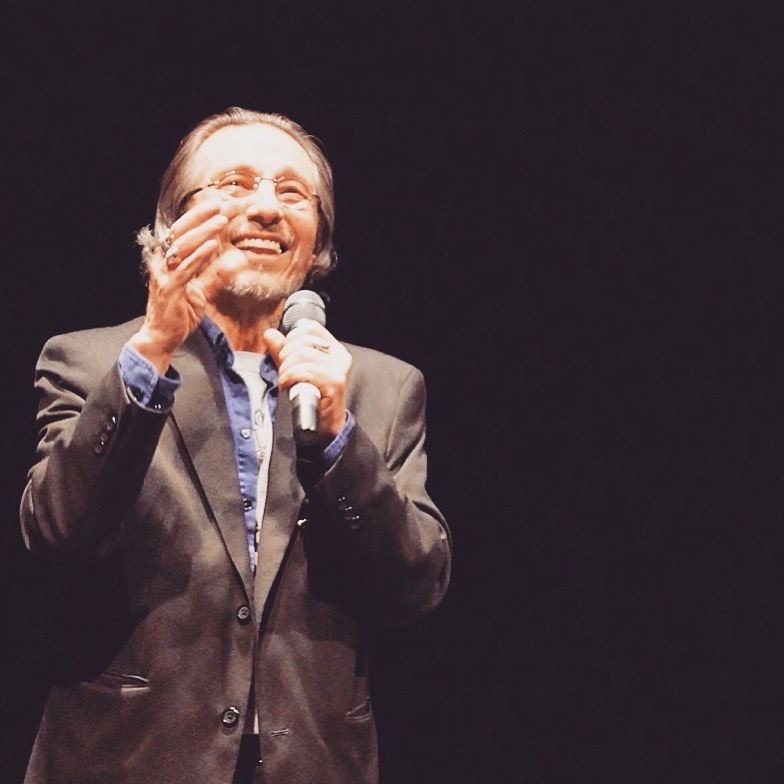 Right now, as I think of all the times Trudell’s words centered me, inspired me, and lifted me, all I see is a human trying to grasp and share the meaning of being. He had so many obvious gems like the quote above in between his rapid-fire, free-flow speaking that sometimes left the audience a bit lost, like, what exactly does he mean when he says, “The illusion of freedom is that it isn’t free; the reality of freedom is that it isn’t free,” because ‘illusion’ and ‘reality’ by definition are, you know, opposite words. But then, as he kept running with the flow of thought, he’d eventually say something that would make everything he said before click, like, “They tell you to get an education, that you’ll live a happier, more productive life with a better job, but to get that education they tie you down with student loans you’ll never break free from.” And I’m like, YES! The illusion of freedom is that it isn’t free [and you have to work for it in order to obtain it]; the reality of freedom is that it isn’t free [because you’ll never obtain it]. And suddenly, you’re in on the joke with the Trickster himself. While I’ve done phone interviews with Trudell in the past, this was my first experience with him live. And while the delivery of his words and concepts was new to me, hearing the content was like coming back home, comforting and familiar. Everything he presented has at some point been published, as poetry, as song, as interview, as documentary, as Internet meme. But like any real truth of the world, it needed to be said. In this, Trudell truly is an Indigenous prophet for our age. And yet I think that’s the best photo I took all night, as it captures everything about him I took with me: An essence of an imperfect someone simply trying to think and be. Two things to which we should all aspire.